Welcome to the Newsroom of Taft Hill Orthodontics, where we provide you with the latest press releases featuring Dr. T.C. Hardy and our Fort Collins orthodontic practice. 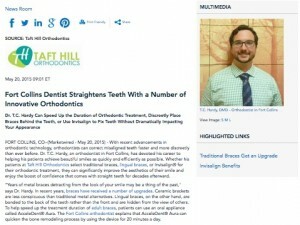 The links below will lead to reports about recent developments in orthodontic technology, Dr. Hardy’s unique approaches to treatment, and the latest trends in adult and child orthodontics. Dr. Hardy is a strong advocate for patient education and encourages anyone considering orthodontic treatments such as ceramic braces, Invisalign®, or others to peruse the material below and on our website to become more familiar with your treatment options. Though braces are often associated with children and teenagers, Dr. Hardy also specializes in adult orthodontics so that patients of any age can enjoy the confidence that comes along with straight teeth and a beautiful smile. Our staff will be happy to answer any questions you might have after reading about our practice. Please contact us today to learn how you or your child can benefit from orthodontic treatment. Dr. Hardy can speed up the duration of orthodontic treatment, discreetly place braces behind the teeth, or use Invisalign® to fix teeth without dramatically impacting your appearance. Lakewood, CO — With recent advancements in orthodontic technology, orthodontists can correct misaligned teeth faster and more discreetly than ever before. Dr. Hardy, an orthodontist in Lakewood, has devoted his career to helping his patients achieve beautiful smiles as quickly and efficiently as possible. Whether his patients at Belmar Orthodontics select traditional braces, lingual braces, or Invisalign® for their orthodontic treatment, they can significantly improve the aesthetics of their smile and enjoy the boost of confidence that comes with straight teeth for decades afterward. “Years of metal braces detracting from the look of your smile may be a thing of the past,” says Dr. Hardy. In recent years, braces have received a number of upgrades. Ceramic brackets are less conspicuous than traditional metal alternatives. Lingual braces, on the other hand, are bonded to the back of the teeth rather than the front and are hidden from the view of others. To help speed up the treatment duration of adult braces, patients can use an oral appliance called AcceleDent® Aura. The Lakewood orthodontist explains that AcceleDent® Aura can quicken the bone remodeling process by using the device for 20 minutes a day. Alternatively, Invisalign® employs an entirely different method of straightening teeth. Utilizing a system of removable clear plastic aligners, Invisalign® provides a nearly invisible orthodontic solution. When comparing the aesthetic advantages of Invisalign® vs braces during treatment, Dr. Hardy notes that “many patients believe Invisalign® is the clear winner.” However, Invisalign® has a number of additional benefits, as well. Compared to traditional orthodontics, the Invisalign® system simplifies daily maintenance, often requires fewer office visits, and can reduce the overall treatment duration. With so many options for orthodontic treatment, Dr. Hardy takes time during the consultation process to thoroughly explain the advantages of each method and help his patients make an educated decision about their oral health. Regardless of which treatment method is selected, Dr. Hardy’s goal remains the same: to provide his patients with straight teeth and a healthy, beautiful smile. A board-certified orthodontist, Dr. Hardy graduated from the Tufts University School of Dental Medicine where he also earned his Certificate of Orthodontics. He went on to receive his Advanced Education in General Dentistry at Lutheran Medical Center in Brooklyn, NY. Dr. Hardy now leads his own private practice in Lakewood and is an active member of the American Association of Orthodontics, the American Dental Association, and the Colorado Orthodontic Association. He is available for interview upon request.